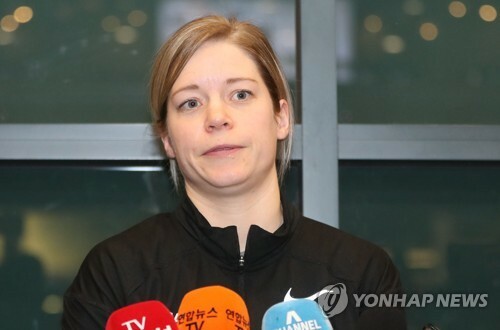 INCHEON, Jan. 16 (Yonhap) — South Korea women’s hockey head coach Sarah Murray said Tuesday her players will suffer “damage” if North Korean players are added to the team for next month’s PyeongChang Winter Olympics. 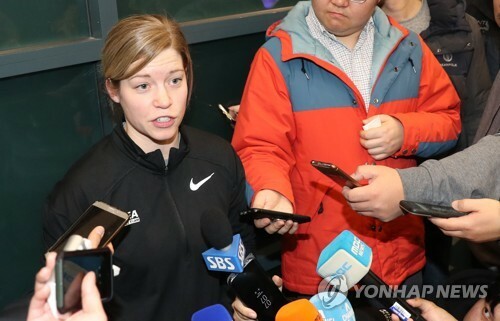 Murray made the remarks after returning home from the team’s U.S. training camp in the wake of the South Korean government’s proposal to form a single Korean team at the Olympics. 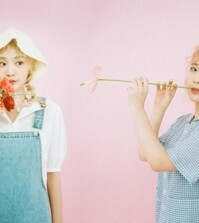 Both Sports Minister Do Jong-hwan and Prime Miniter Lee Nak-yon have gone on record as saying adding a few North Korean players to South Korea’s current 23-player roster will not affect homegrown athletes because hockey is played in short shifts and players all get turns taking the ice. But their stance overlooks the fact that the Olympic roster is set at 22 and at least some players, either South Korean or North Korean, will likely have to sit out as healthy scratches. South Korea made the joint team proposal at high-level inter-Korean talks last Tuesday, during which North Korea offered to send an athletic delegation to the PyeongChang Olympics. The two sides will further discuss the hockey team issue and other matters at a working-level meeting Wednesday. South Korea’s proposal for a single Korean squad wasn’t made public until Friday. And Murray, daughter of former National Hockey League head coach Andy Murray, said she only found out Sunday that this was happening, and she didn’t actually hear anything directly from the sports ministry or other government sources. She got calls from her national team staff and also from reporters at NBC in the U.S. and CBC in Canada. “I am kind of shocked this happened so close to the Olympics,” Murray added. The PyeongChang Games start on Feb. 9 and South Korea’s first game is the very next day against Switzerland. “When rumors were going around about this happening, I didn’t really believe it. And it’s getting more and more serious now,” she added. Seoul’s push for the joint team has met with some backlash from a public that understands South Korean players may be robbed of a chance to play in what could well be their first and last Olympics. South Korea, ranked 22nd, is making its Olympic debut as a host nation, and despite recent progress, is not yet good enough to qualify for Olympics on merit. Murray’s team is an eclectic group of overachievers with chips on their shoulders and budding teenagers who have already been through some big moments on ice. Their overcoming of adversity on and off the ice has been well documented, and collectively the women’s hockey players have attained the status of sentimental favorites at the Olympics. Murray said her players are now faced with another challenge and they should try to clear the latest hurdle. Do, the sports minister, first broached the possibility of a joint hockey team last June, but the idea didn’t seem to last long, with critics questioning its feasibility. Murray admitted that once such talk was finished last summer, she didn’t think the matter would be raised again. 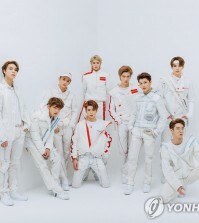 South Korean officials have said they’re seeking to keep the South Korean roster of 23 and add extra North Korean players and that they’ve asked the International Olympic Committee (IOC) and the International Ice Hockey Federation (IIHF) for cooperation. According to these officials, the IOC and the IIHF are also seeking understanding from other participating nations because a roster expansion granted to only one team would create an uneven playing field. And no matter how many North Koreans are added, Murray said no one will be guaranteed ice time.